Hi fellow Zelda Dungeon fanatics and welcome, once again, to another Timeshift Thursday feature! This week I’m looking forward to sharing and discussing a climatic battle scene with you from Link’s latest adventure, Skyward Sword, in which I’ve found the combat before the corresponding final battle to be a richer, more difficult experience. Because Skyward Sword doesn’t include the most amount of highlights for a Zelda game, in my opinion, I haven’t leaned toward writing a feature revolving around the title. Yet, because we are discussing famous Zelda battles now, I do want to write about, possibly, my favourite part of Skyward Sword. Today, we’ll take a look at the extensive Horde Battle brought about by one of Link’s main antagonists in Skyward Sword, Ghirahim. This section of end-game battle sequence truly tests Link’s reasons as to to why he is blessed with the Triforce of Courage. It is an outstanding test of courage and we shall see that further along the article! If you want to read more about Link’s excruciating battle with Ghirahim’s minions then click the jump below and take the full descent toward the Sealed Grounds! 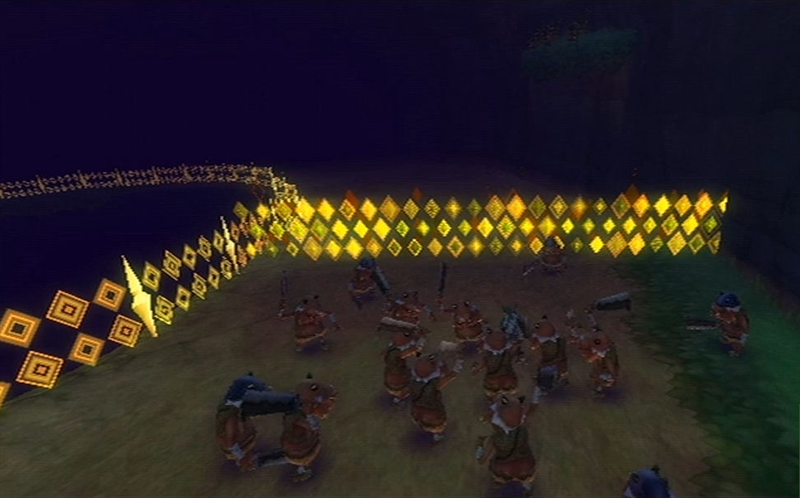 The Horde Battle in Skyward Sword occurs just after Ghirahim abducts Zelda, prepares to complete the ritual to revive his much-desired master, Demise, and spread malice right across the Hyrulean world. Link must make the steep descent down the large spiral pit and reach the bottom of the Sealed Grounds where the ever-breaking seal locking The Imprisoned has been kept. This isn’t one simple hike down the path, though! As you descend, five separate, non-identical waves of enemies consisting of deadly Bokoblins (some are archers while others carry bombs), Moblins, and Stalfos rain terror and violence upon you only willing to give a permanent dicing to your body allowing Ghirahim to unleash Demise from his bonds. The amount of hordes dumped upon you may seem like an insane test but really it’s all hack and slash as you fight your way to the bottom of the Sealed Grounds. The Moblins and Stalfos are a tougher class of opponent and strategic positioning must be utilized if you plan on having enough hearts to withstand Ghirahim’s crafty combat. Some Bokoblins also stealthily hide at the back of the pack blowing horns to summon more of their kin creating a further gruesome challenge. You may not know but the tune the Bokoblin horn-blowers play is the exact melody the Flute Boy plays in A Link to the Past and happens to be the only time you hear this sound in Skyward Sword. Quite neat I reckon! The Horde Battle reminds me a bit of a certain Majora’s Mask fight in which Link battles against Captain Keeta. In this similar battle, Link must fight a wave of Stalchildren who attempt to stop him from reaching Captain Keeta. Anyway, I found the Horde Battle to be miles harder than facing against Demise himself. With Demise, all you need to do is shield block at the right time in the first phase of the final battle, and then strike quickly while dodging him is simple. The second phase is a little harder but no big challenge. Just haul your sword in the air, let lightning illuminate it, and swing the electric power at Demise, zapping him in the process. It’s so much tougher trying to dodge around 20 Bokoblins and also destroy their horn-blower who keeps bringing more of his counterparts back into the fray. Also, with the 1:1 combat of the Wii MotionPlus, trying to slash the Stalfos can be tricky business considering their defensive skills are top-notch. Then, you also must be sure to safeguard hearts for the battle with Ghirahim which appears straight after you defeat the hordes. What are your thoughts on the Horde Battle experienced near the end of Skyward Sword? Do you like the way the combat has been set up for gameplay? Do you think this battle is more epic than facing Demise? Please be sure to share your thoughts and opinions below!